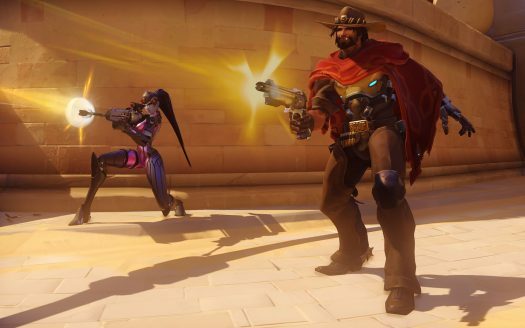 Widowmaker (left) and McCree (right) fire off shots at the enemy. Three minutes into the game, and the blue team has already got the payload past the second checkpoint and on its way to the third. The loss seems inevitable for the red team. There seems to be no hope left, but they keep defending. The red team shuffles through different characters, trying to find the correct combination that’ll work best against the currently dominating blue team. Then, there it goes, a huge mistake by the blue team just three meters from winning. Red team sees this and drops all of their ultimate abilities in synergy. Zarya shoots Graviton Surge, bringing all six members of the Blue team together so that everyone can fire. Hanzo peeks out of a corner and launches his Dragonstrike, able to hit the whole enemy team because of Zarya’s ultimate. In seconds, the Blue team has been wiped out. This was enough for the red team to see that they have a chance at winning. They ended up defending for a win. Pre-release, Overwatch gained a lot of publicity in the months leading to its release. The open beta attracted approximately 9.7 million players worldwide, sparking an enormous amount of media attention before its release. After the public beta, the game was officially released two weeks later on May 23, 2016, for Windows, Playstation 4, and Xbox One. The player base reached more than ten million people worldwide within three weeks. Overwatch is a particularly unique game when it comes to its content. Unlike many other first-person shooters, the game is extremely colorful and has a cartoonish feel to it. The game takes place 60 years into the future, in a fictionalized planet Earth. Overwatch was an organization that formed 30 years earlier to end the Omnic Crisis, where robots (omnic robots) rebelled against the humans. Overwatch does not have a campaign mode for players that prefer playing single-player mode games. The only mode that is closest to single-player gameplay is to play with bots (AI programmed players). You can easily create a game with bots to practice against, but the main objective of the game is to play competitively with other, real players. The multiplayer game modes are Quick Play and Competitive, where Quick Play is meant to be played casually and Competitive involving a skill-based ranking system. Finally, there is the brawl mode, which is a weekly mode with increased or decreased wait times on different player abilities, focused on a particular goal, hero class, or map. Currently, there are 22 characters are available to play that are consistently well-designed and balanced. Each hero has their unique learning curve, advantages, and disadvantages. Anyone can put a ton of time into a single character to improve, and by the time that character is mastered, there’s 21 more to go! For example, Soldier 76 is well-known for being one of the more introductory characters. His primary weapon is a machine gun, which is relatively simple to fire and to hit enemies. He can sprint to quickly evade danger and to drop a healing circle. He also has the choice to fire powerful rockets as another ability. Overall, Soldier 76 is a well-rounded character, which is where most of his simplicity comes in. On the other hand, a character like Zarya, which is one of the more versatile tanks in the game, is much harder to play well. This mainly comes from her ability to summon shields on herself and and an ally, which soak up damage and grant her more damage. The combination of Zarya’s shield and low damage output without it makes it difficult to play her at a competitive level. Each hero has a fundamental outlook and a background story about the battlefield. They have sets of devastating and game-changing abilities, such as freezing enemies, using jet-powered armor suits, playing as an assassin that can appear anywhere, unleashing special powers such as dragon strike, transcendence, graviton surge, and more. Even when it seems like your team is doomed to go down in defeat, you can immediately switch heroes and change the course of the game. Anyone can master the game as both teams shift strategies and playstyle in a continuous dance to gain the upper hand for victory. Teamwork is crucial for survival as a combination of coordination and personal skill can make the difference between victory and defeat. With the game’s recent release, Blizzard has faced many issues regarding hero balance. Since the official launch of the game, one of the heroes in Overwatch, Genji, has become a bit of an annoyance to some players. Genji’s Japanese yelling, which indicates the use of his ultimate ability, is usually associated with a team’s death. Even though Genji has a high skill-cap (meaning he is hard to learn), players who have mastered this ninja can wipe out an entire enemy team. However, Genji wasn’t the only powerhouse in the game. A support-based hero, called Zenyatta, has a discord orb that he can place on enemies to make them take an extra damage percentage. By August, the game was dominated by ball-shooting Zenyatta and sword-swinging Genjis. Blizzard took action by releasing an update September 1, 2016, nerfing (making something less effective or desirable) Genji’s mobility to the ground and Zenyatta’s Discord Orb’s damage percentage. In addition to the various aspects of gameplay, the graphics scaling makes it so that Overwatch can efficiently run on any personal computer with a running graphics card starting from as long as five years ago. This way, the game is accessible to anyone, which is why the player base of the game has consistently remained high. Blizzard has taken advice from its community extremely well, and have created several patches to remove glitches, fixing hero balancing and other gameplay mechanics. Nonetheless, Overwatch easily joins the ranks of top-level game franchises, as it is easily one of the most popular and well-made multiplayer games coming in this decade.